Harmony devices are known for their ability to chain together sequences of tasks involving many different pieces of equipment. Using RF and infrared signals, You can initiative a given activity with a single button press. A “Watch a Movie” sequence for instance, can turn on your TV, set it to the correct input, turn on your set-top box or Blu-ray player, your A/V receiver or powered speakers, and then start playing the movie without any further intervention on your part. This is considerably more convenient than turning on each device and setting the correct parameters on everything one at a time. You could soon use the Ubi voice-controlled computer to manage your entertainment system by way of a Harmony remote controls. 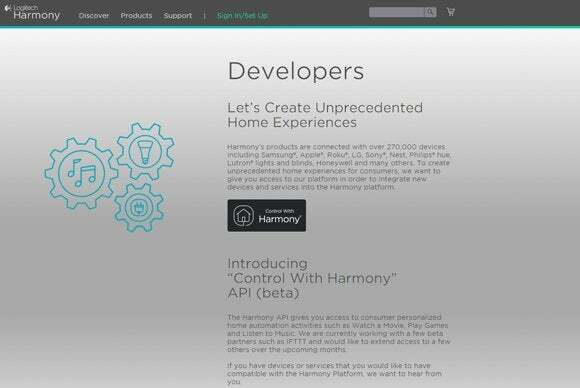 Logitech says its Harmony products are already connected to more than 270 thousand devices from manufacturers such as Apple, Honeywell, LG, Lutron, Nest, Philips, Roku, Samsung, and Sony. Opening its API could allow a company like Lutron to add the ability to dim the lights and lower the motorized shades on your windows to that sequence, using Lutron’s Caseta platform. “By opening our platform to developers, we’re giving developers the ability to create complete smart home experiences,” said Logitech’s Mark Spates, who manages the smart-home platform for Logitech.